More and more workshop managers, health & safety managers and HR professionals up and down the UK are taking advantage of the mobile column lift training available from TotalKare. The UK’s leading provider of heavy-duty vehicle lifting solutions launched its online mobile column lift training platform last summer and has since been inundated with interest from workshops wanting to ensure their staff operate mobile column lifts in a safe and effective way. The training can be accessed via smartphone, tablet, laptop or desktop device and consists of video tutorials, instructional guides and multiple-choice test questions. It takes individuals through two core modules (Rules and Regulations and Safe Use of Ancillary Equipment) before further modules specific to the models of mobile column lift in use in their workshop. Some of the areas covered include legislation, pre-use safety checks, lift controls, floor stability, floor obstructions, height clearance and ancillary equipment. Once successfully passed, the candidate will receive a driving license-style card that lasts for three years and informs employers they are competent to work on mobile lifts. Over 500 users have now completed the training, with workshop managers impressed with the flexibility of the course and reduction in downtime caused by staff no longer being trained as a group. Steve Braund, Marketing Manager, explained: “While the quality of TotalKare’s product range speaks for itself, what differentiates us from other suppliers is the high level of service we provide. 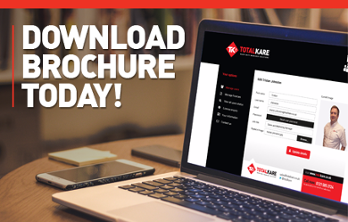 The introduction of our CPD-certified training was a natural extension of this and by doing so, TotalKare is raising standards and cutting out accidents in the commercial motor and bus and coach industries. “Initially we offered a more traditional training course that lasted for half a day. The content was heavily praised, but we received regular feedback that the prospect of losing groups of operatives from the workshop for the duration of the training had an adverse effect on productivity. He continued: “Recognising this issue, TotalKare invested in the creation of an online training platform which individuals can access at their leisure wherever they have an Internet connection. Candidates can complete the training at a time to suit them, and their progress is saved after each module which means they can even do it in stages if preferred. Administrator access provides a dashboard view showing the real-time progress of all operatives set up on the training, so workshop managers can quickly understand who has completed the training and who is yet to do so – ideal for demonstrating compliance.